I’ve been asked “are you moving?”, “will you put bars on the windows?”, “can you even sleep at night?” I’m beginning to think that most people get their notions of “bad guys” from television and movies, and not from real life. First of all… theft happens everywhere. Actually, I’ve had more petty car break-ins in the suburbs than in the city. Secondly, its not like the people who do this have any sort of vendetta… they’re looking for stuff to sell, not people to mess with. Taking it personally, imagining some sort of after-theft, or radically changing the routine is pointless, and would only serve to further inconvenience and demoralize. You lock your doors, you make sure valuables aren’t clearly visible, you keep an eye out, but most importantly you live your life in a way that makes you happy. Fear is often a terribly vain emotion. The world is not out to get you. On the contrary, it doesn’t really give a damn about you, which often explains its actions way better than premeditation could. Friday was a very long day at work, then another amazing Satellite 4 show. There were go-go dancers on stage. I need to pay go-go dancers to follow me everywhere. It adds a lot. Great show, though. We went on at midnight, everyone was dancing… it just amazes me how well those things all come together. Three and a half hours of sleep later, and yet another long day of work. Saturday night into Sunday was pretty much just sleep. Had a big gig in Oklahoma set for this coming Friday that cancelled at the last minute (was going to take three days off this week and get a pretty handsome payout from it), but wound up playing a last-minute invite in Kirkland Sunday night. Like I said, music is really about the only thing that’s panned out out here for me, but that’s fine… it wasn’t even really on the to-do list at first. Today Jenelle, a dear old friend from college, needed a ride to the airport from her post-grad-school sabbatical on Whidbey Island. Catching up with old friends is a rare thing out here, and Jenelle is definitely one of my favorites. We had a few hours in between, so I figured she needed to see the mountains. 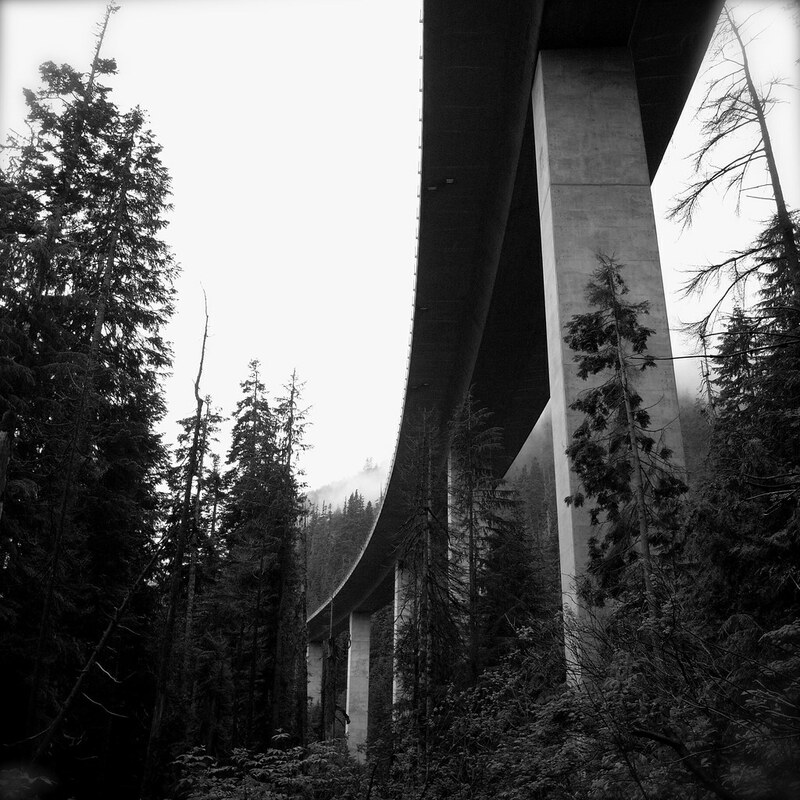 A quick trip out 90 to eat God’s own pancakes at Snoqualmie Summit, and take in a too-short hike along Denny Creek… I had never done that before, and its really quite amazing to be in the middle of the wildnerness, look up, and see the interstate flying through the air. I’m sure there’s a profound deep and multifaceted illustration there. I’m too tired. Both Amazon and iTunes appear to have authorized redownloads of the missing music collection that I got through them. I have a new, much better TV and laptop… just waiting on the insurance to come through so I can afford new gear. It would be awesome if I could find the old Nord (it – and the backup hard drive – are all I’m really interested in), but like I was saying about a drastic change in lifestyle being kind of pointless… I could have spent this whole weekend on the phone, frustratingly trying in vain to call every pawn shop and used gear store in the Northwest to track this stuff down, putting bars on the windows, adding more deadbolts, feverishly cobbling together a time machine…. or I can go outside, enjoy my life, and use the insurance I’ve been paying for. Life’s too short to stoop down to the bastards’ level. They do what they do, you do what you do… hopefully they balance out, preferably you win. You, my friend, have the most indomitable of all indomitable spirits. You amaze me. Really…well done, Jeff. If it had been me, prob would have gone something like this.